I don't like "things" to be visible or disorganized. My last place had a huge closet with tons of shelves that I kept all of my towels, linens, and hygienic products in. I called it my "Walgreens" closet! However, the place I live now has a totally different layout, so I decided to get organized with some baskets. Finding the right baskets was a total challenge. I went to many stores with my tape measure in hand. I took up many aisles spreading baskets out to see what different combos would work. After searching high and low, I finally found some perfect fits! Two baskets for linens and towels (one for each category- linens on left, towels on right). Fun tip: rolling towels instead of folding them saves space! Other products like spare bars of soap, mouth-wash, q-tips, etc are all stored beneath the sink. 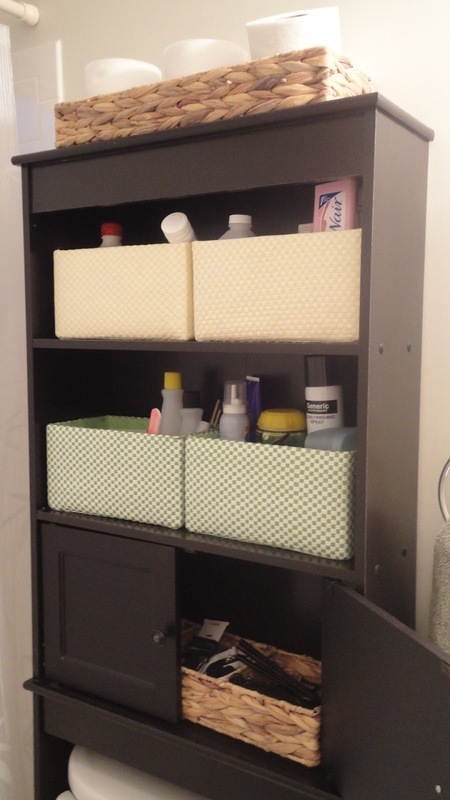 This is not a storage tip, but something fun for the bathroom that I thought I'd add! 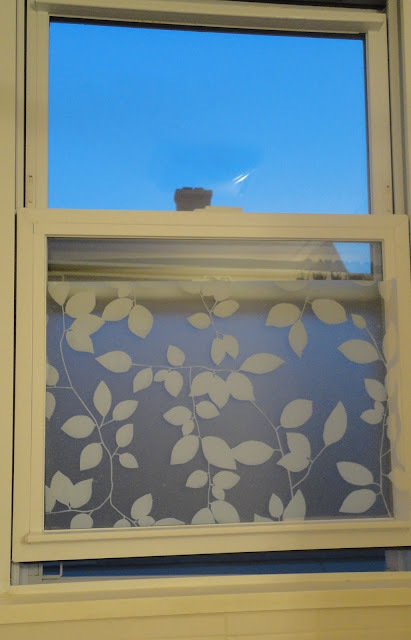 This window is located inside my shower... and I felt a little funny about being able to see my neighbor's house while showering! I hope they couldn't see me since I'm short and only my head can reach the window- however, I still wanted added privacy. I found this great window sticker online made specifically for situations like this! It was an easy application- basically you cut the sticker to size, then use water as your adhesive, then scrape out the excess water.. and then it's done! I love it! I love the privacy and also the cute design!